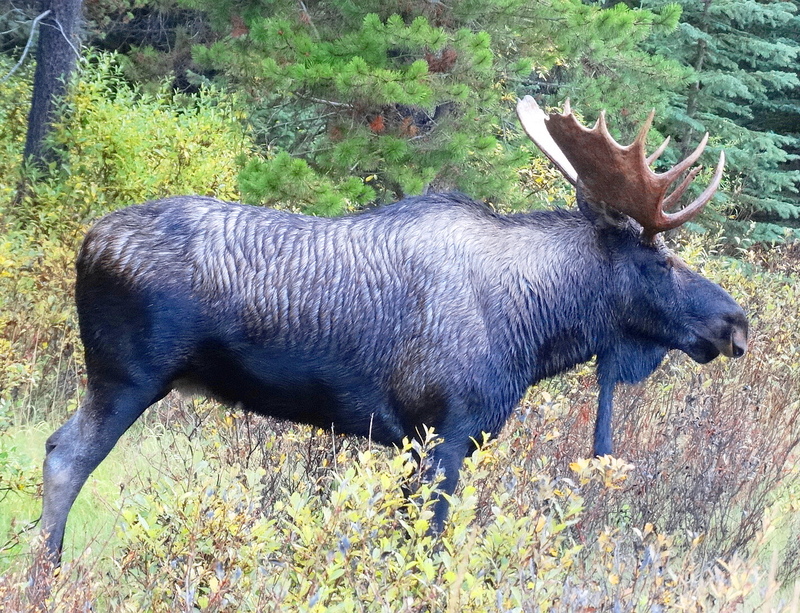 What to do when a bull moose walks right by you and you are in the middle of the wilderness? Back up slowly and take a pic…. 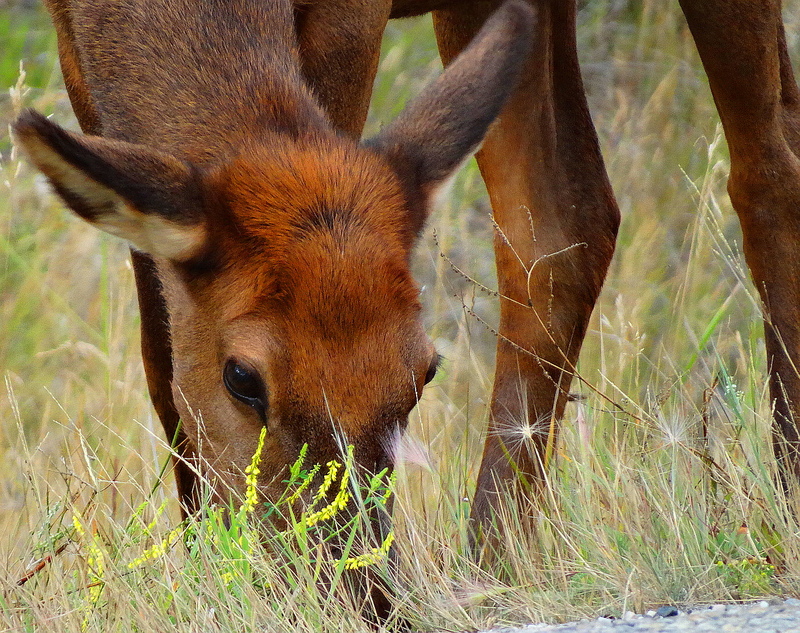 Here is a sweet-faced peaceful lady elk. I was taking her pic from fairly close by, and she was unperturbed. And bugled at me loud enough to wake the dead! You can see him bugling at me in the lower pic. I got the message and backed away! Letting true love take its course. 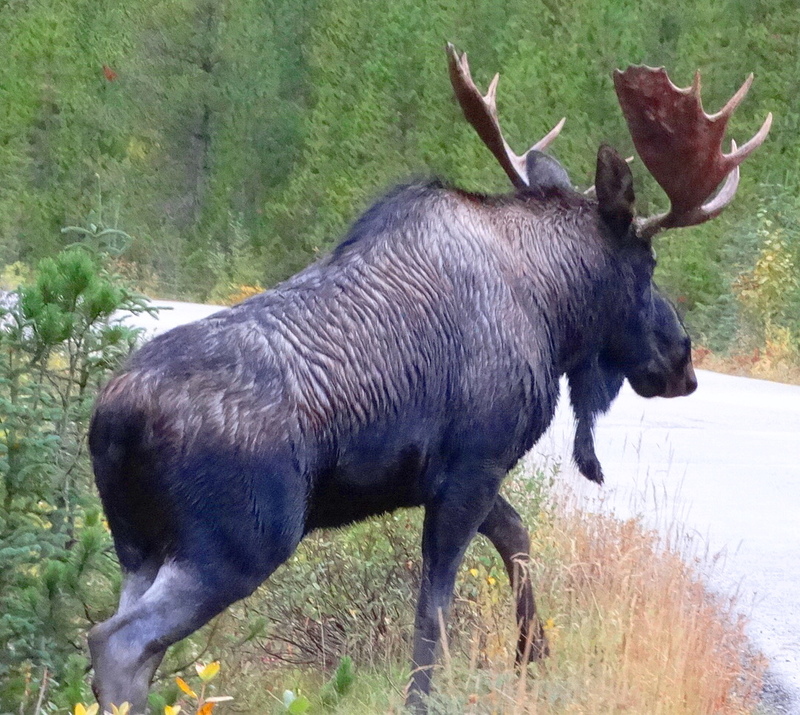 The males are out bugling in front of our cabin every night and it is most exciting! I run out with a flashlight catching glimpses of them. 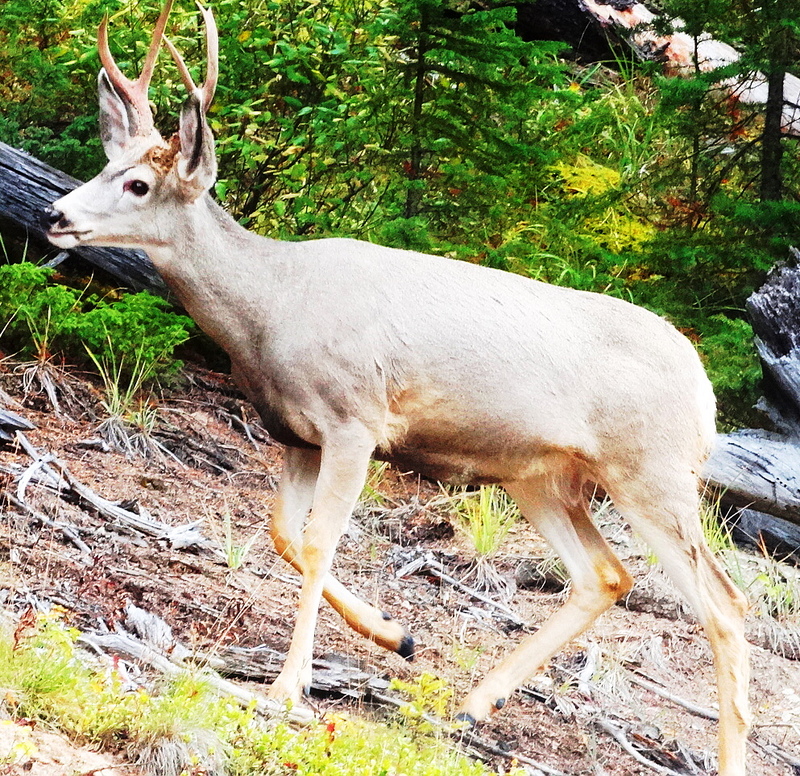 Male Mule Deer are Everywhere. This particular guy has amassed a pile of pine cones 12″ x 12″ round and at least as high! He’s not going hungry this winter! The last moments of fall are lingering in Jasper, but winter winds are already here, snow is covering the mountain peaks, and winter is coming! 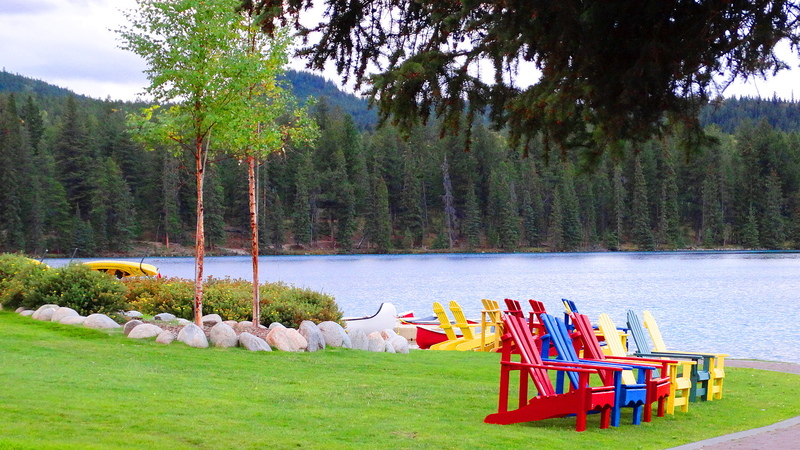 Time to pack up the canoes and chairs by the lake until spring tip-toes back next year! Cheers to you from Jasper NP, nightime temp tonight 26F. ← Beauty is Truth & Truth Banff! What a beautiful time you must be having! Still think you should be filming for Nat. Geo., Cindy. You have a natural feel for a scene and a wonderful touch with the camera. The pics are great…, all of them. I knew you’d find that moose!!! Looks like you’re having a great trip (I’m envious). Take care. I knew because I knew you’d be looking for one. Those are some huge animals. Must have been marvelous and scary all at once. Glad that you could stay calm. Still, what a gorgeous place–another one of nature’s triumphs for her children. Oh my gosh, close encounters! But you keep calm and carry on! And to you my friend with gratitude. They are magnificent creatures!!! What a fabulous collection of photos! Well done, Cindy. National Geographic standards!! You are so kind! I will be in Vancouver in the spring, hope I can take you out for a latte? Lovely and some funny entertainment! The critters are so entertaining. The squirrel took a French fry off my plate, while I was eating it!! Haha! Don’t all men act a bit deranged if you get in the way of ‘love’? Elks in rut definitely have attacked people. Mostly though, short of surprising them or being disrespectful of their space, you are okay. People are more dangerous actually! Beautiful photos and light-hearted storytelling–a perfect antidote to an hour spent in city traffic! I know we had to choose Alaska or Hawaii I said I will ALWAYS go to Hawaii it’s inevitable so… Alaska it was! I am an OFFICIAL sour dough! Going to the google machine NOW to see that video! Hawaii is lovely, but there are no BEARS!! Looks like you’re enjoying your stay, I’m so glad you were able to come. Great photo’s Cindy. 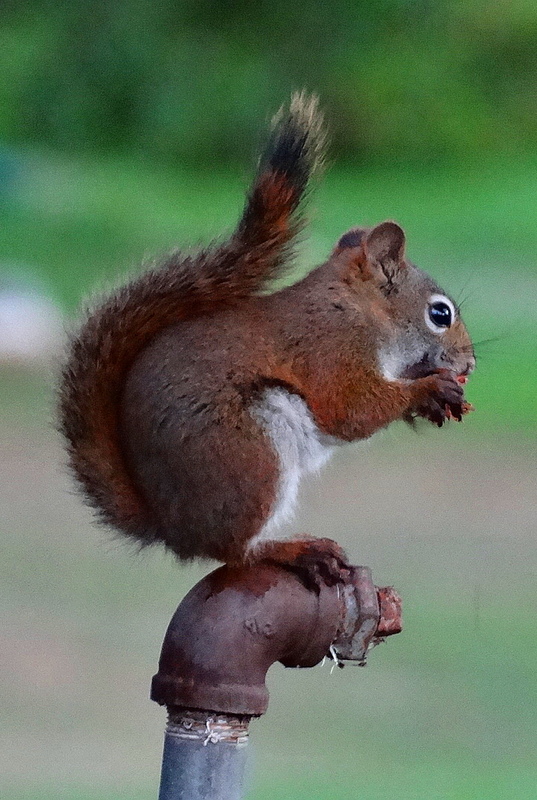 I love that little squirrel on the water faucet. 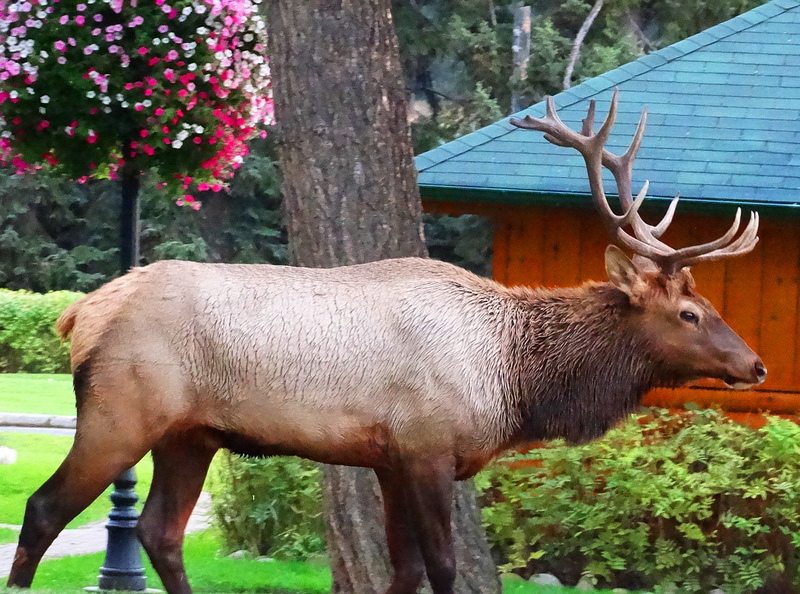 We’ve stayed at Jasper Park Lodge, it’s so pretty in summer. The temps in Edmonton (6 hrs drive) have been cool at night but warm in day. Hope you got some sunshine for your visit. 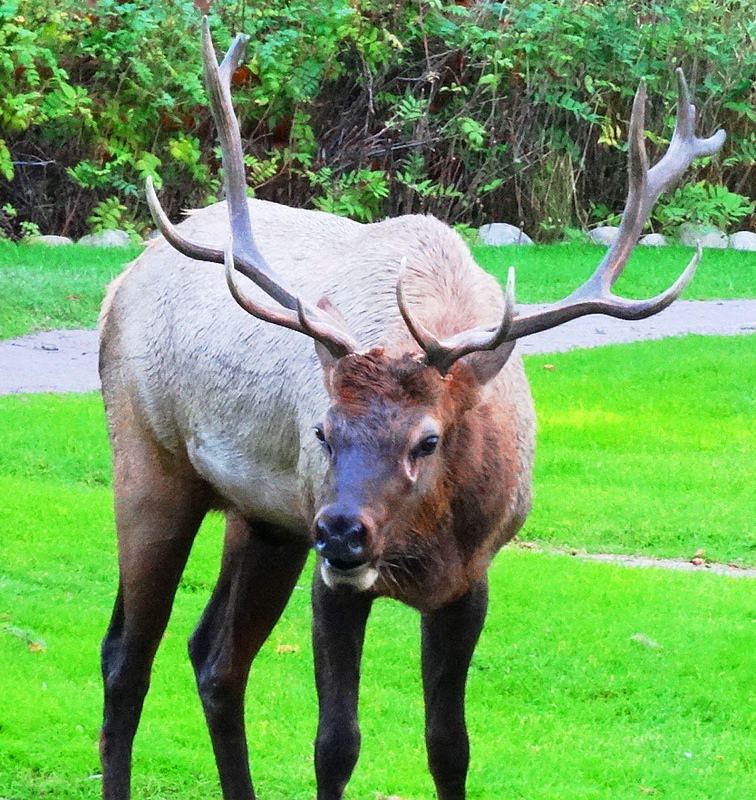 The female elk has a beautiful face, beautiful eyes. Glad you were able to stay out of the male’s way! Isn’t she a gentle beauty!! I really enjoyed her and she was calm as could be! Wow Cindy – you were too close for comfort in some of these shots. I’m surprised you weren’t charged! How great was this experience? Love seeing the close-ups and reading about wildlife in their own world. So cool! I think I would have gone for the camera too. The lady elk is lovely. 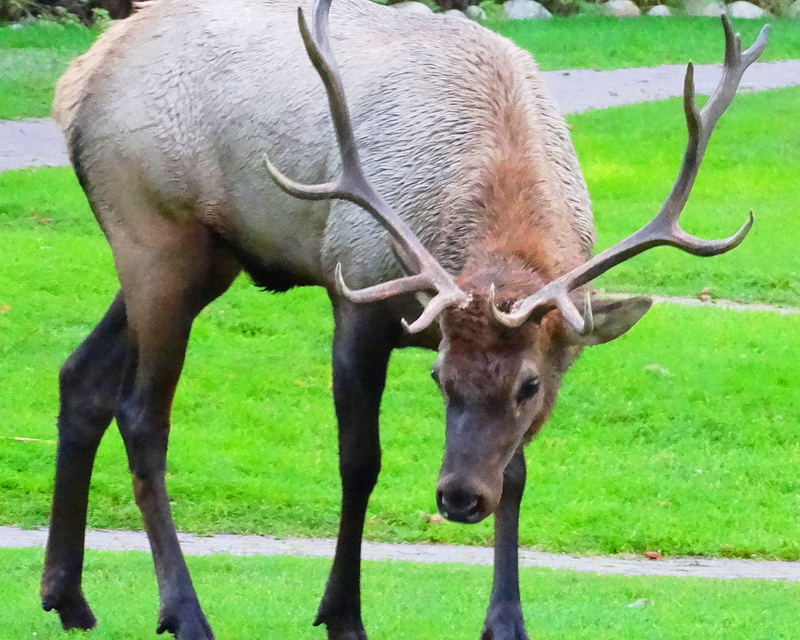 The male elk do look a bit intimidating. It must be a thrilling experience to meet them… Great photos! I looked at the fur of the lady elk up close. It is really beautiful! Isn’t she lovely!! Thank you for noticing! 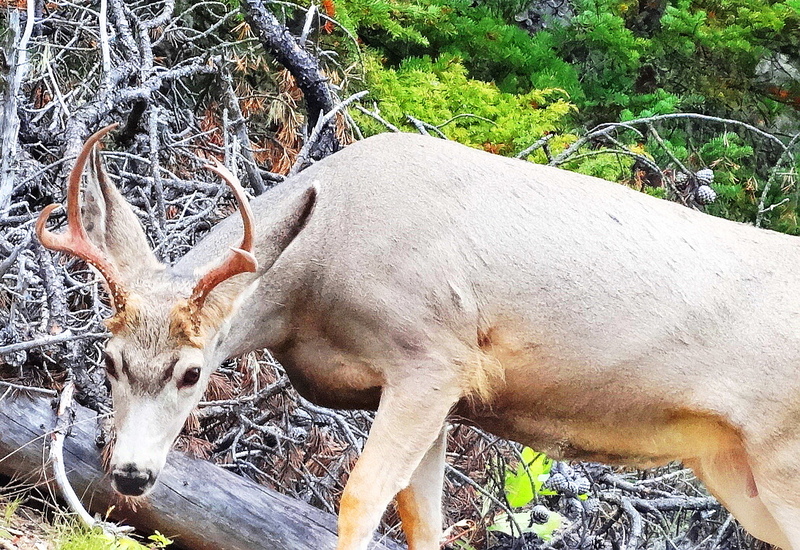 Had to return for a second look, show my son these beautiful shots, he lived in Boulder for years and remembers such wildlife in the parks around the area. Thank you for sharing. Dang, everything’s looking all summery and warm in your pictures and then you break the news that the nighttime temps are going to be 26 degrees — brrrrrr! Lol, blanket weather for sure. You do have a lot of great wildlife coming by where you are staying, and it is beautiful country up there! 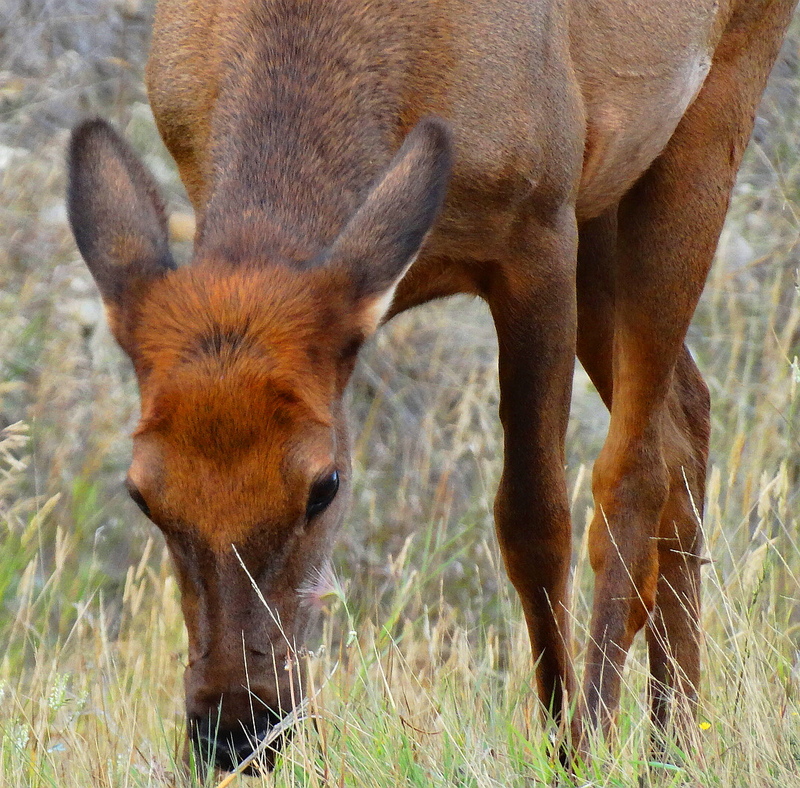 My favorite shot, though, has to be that first picture of the female elk — it is priceless! Btw, a little off the subject — I did receive your wonderful poms, and am going to send you a note with more detail; I just wanted to let you know they arrived safely and soundly. Thank you so very much, and I posted about it here: http://becky6259.wordpress.com/2013/09/14/6183/ . Please let me know if you would like me to alter or remove the post and I will be glad to — I really should have asked you before posting it. Loving the poms, and again, thank you so much! I’m really enjoying them! It looks like you are enjoying your self Cindy…wildlife and all! Cindy, these are amazing photos. Thanks for sharing what seems to have been a rather exciting adventure with the wildlife! Yellowstone has to be my favorite US National Park due to the wildlife. Your moose is most impressive! Exciting times Cindy, great photos. Hope you have your thermals with you, or a big log fire in your cabin. 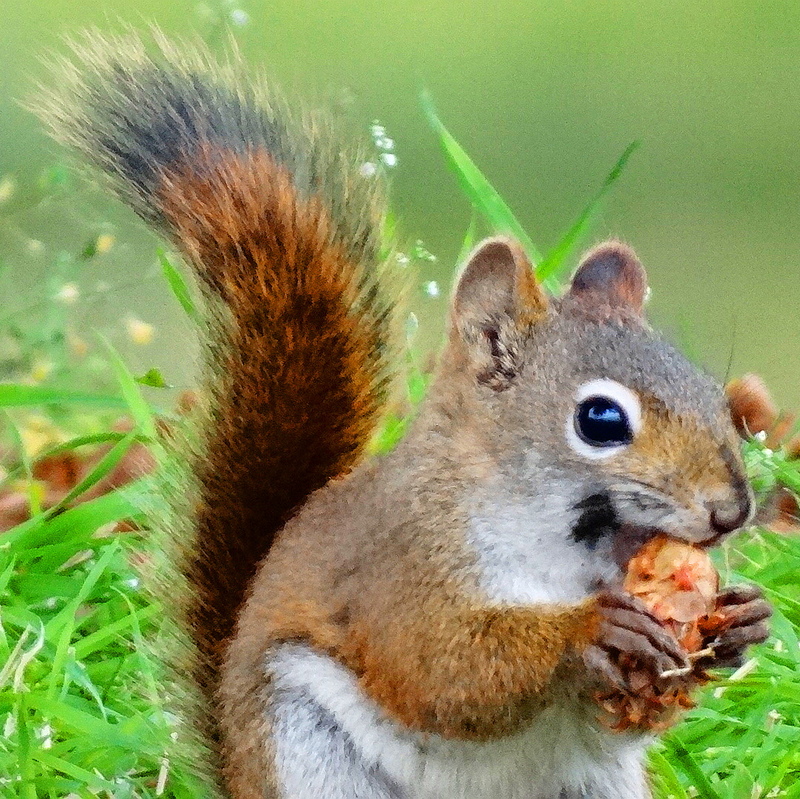 That squirrel is so cute. Your work just gets better and better. You are down your own rabbit hole, Cindy, where the world is a much more vivid place. Oh I love your rabbit hole metaphor!!! PERFECT!! And I definitely plan to stay down here!! By curious coincidence I posted this almost a year ago to the day…. Gotta love that story. Just how bad can your day get? Yeah Jung would love this as would Wilhelm Reich. Happy you enjoyed and have an awesome week!